Monday, October 15, 2012 ratings — We had another full night of primetime television with all original episodes — Dancing with the Stars, Castle, The Voice, Revolution, How I Met Your Mother, Partners, 2 Broke Girls, Mike & Molly, Hawaii Five-0, 90210, and Gossip Girl — plus Major League Baseball. On NBC, The Voice won the night in the 18-49 demographic with a 4.8 rating (on par with last week’s) and 11 million total viewers. 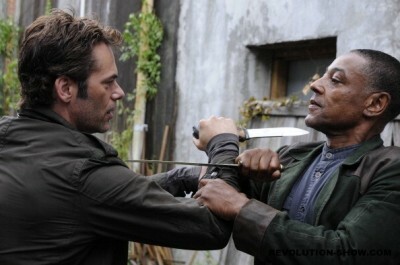 Revolution stopped falling and drew a 3.4 rating (+13%) with 8.8 million viewers. On ABC, Dancing with the Stars led the night in viewership with a 2.1 rating (-5% week-to-week change) and 12.4 million. Castle followed with a 2.0 rating (-9%) and 10.9 million. On CBS, How I Met Your Mother drew a 3.2 rating (+3% change) with 8.1 million. That was followed by Partners with a 2.1 rating (+11%) and 6.2 million viewers. At 9pm, 2 Broke Girls attracted a 3.3 rating (-3%) with 9.2 million and Mike & Molly garnered a 3.0 rating (+7%) with 9.0 million. Rounding out the night was Hawaii Five-0 with a 2.0 rating (+5%) and 8.4 million. It tied ABC’s Castle in the demo for second place. On FOX, the MLB Play-offs attracted a meager 1.3 demo rating and 4.75 million viewers. Those are low numbers — but still not as bad as Mob Doctor’s recent ratings. And on The CW, 90210 rose 50% in the demo to a 0.6 rating with 1.1 million viewers. Gossip Girl was steady with a 0.4 rating and 0.8 million viewers. What do you think? What was the best thing on television last night? What Monday night shows have you stopped watching?